I am Justin Vacula, a third-year student at King’s College in Pennsylvania, a member of the NEPA Freethought Society, and an American citizen. 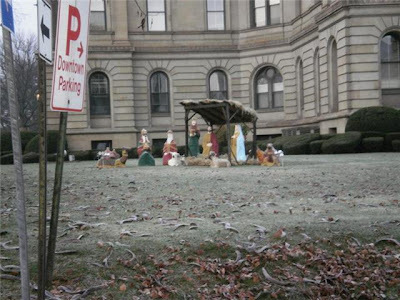 I have recently alerted the ACLU about a religious display at the Luzerne County Courthouse. Its display of a crèche (Nativity Scene) and Menorah are unconstitutional; governments are not permitted to endorse religion (Establishment Clause) nor are they allowed to put up these displays. I seek no reward for this pursuit; I merely want the unconstitutional religious displays removed in order to uphold and defend the great constitution of our nation. The government may have a holiday display, but only if the display is integrated into a broader one and communicates a secular message or thematic unity. Both the menorah and the crèche are standing alone and are far apart from one another. There is also a snowman in the far back, but this is very difficult to see. There is no thematic unity in this display and, for constitutional purposes, each item stands alone. If religious elements stand alone or predominate over other symbols, this is viewed as a governmental endorsement of religion. 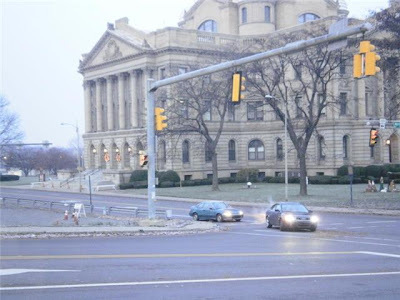 If the county were to designate the courthouse lawn as a public forum, the message would still not change because speech is attributed to the county when the county controls or presents the message. Since Luzerne County displays the menorah and crèche, this constitutes governmental speech. Religious people and non-religious people should support the removal of the nativity scene and menorah because this is a constitutional issue. The United States Constitution is the basis for our nation and the highest law in the land. America was truly founded on the idea of separation of church and state, not on “Judeo-Christian principles” as many suggest. In her book titled Freedom Under Siege, Madalyn Murray O’Hair cited Thomas Paine, George Mason, Benjamin Franklin, George Washington, John Adams, James Madison, John Quincy Adams and, of course, Thomas Jefferson, as early American Deists, people who believe that a non-specific deity created the universe but is no longer active in human affairs. A key idea of the United States government is that we are not a nation that supports a particular religion; we are a secular nation. In 2008, President Obama said the following… “Whatever we once were, we are no longer a Christian nation, at least not just. We are also a Jewish nation, a Muslim nation, and a Buddhist nation, and a Hindu nation, and a nation of non-believers. […] Democracy demands that the religiously motivated translate their concern into universal rather than religion specific values. […] It requires that their proposals be subject to argument and amenable to reason. […] To base our policy making on such [religious] commitments would be a dangerous thing. Similar to what President Obama said, we are a very diverse nation of diverse individuals. All United States citizens are free to worship whatever or whoever they would like: The Flying Spaghetti Monster, Thor, Poseidon, Jesus, Krishna, Allah, or nothing. Our freedoms from and of religion are very important and must be embraced in order to maintain our individual freedoms. If someone would like to follow precepts of a certain religion he/she may, but precepts or ideas ought not be the basis of lawmaking decisions or be displayed on governmental property; there are private churches, private schools, and other private institutions for that. Religion has no place whatsoever in government. We would be enraged if any government official started to speak about The Gospel of the Flying Spaghetti Monster and base policy decisions on this book; this is the way we should view the place of any religion in governmental affairs. Thomas Jefferson and our Founding Fathers were wonderful thinkers who were well ahead of their times. Sure, I’m an atheist who is actively opposed to religion (an anti-theist), but this pursuit is nothing new or special; I would do this during any time of the year and am not “attacking Christmas.” You are fine to have these symbols on your lawn or at your place of worship. The religious symbols may be placed on any private property — a lawn of a church/synagogue/etc — but the lawn of the Luzerne County Courthouse is not the place for this. I’m not reserving Christmas as a special time to “be an atheist;” people know me and hear what I say about religion. I’m constantly criticizing religion in my blog, Facebook, and in public. I’m also a third-year student at King’s College, a Catholic college, and never hide or beat around the bush with my views regarding religion. I constantly meet with priests, theologians, fellow theistic students, and other religious individuals to discuss my views regarding religion and try to understand why people believe what they do. I’m never slow to say that God is imaginary and man-made. I frequently attend open discussions such as The Common Good Group and Perspectives on Scripture with various theistic individuals. This “atheism” is not a sudden or rebellious thing. I’m also not an atheist because “I’m mad at God,” struggling with faith, or am depressed as many have suggested. I was previously active in Saint Rocco’s Roman Catholic Church, but after a great deal of research, discussion, inquiry, debate, and reading, I decided that religion is false, dangerous, and harmful. It’s high time that non-theistic individuals “come out” and make their voices heard regardless of what other people may think of them. We shall no longer be silenced in a nation that holds free speech as a core liberty! The taboo surrounding religious discussion needs to end. Everything should be discussed, debated, and critically evaluated. We certainly do not reserve a special place for politics, movie reviews, views on immigration, or what we think about our neighbors. Religion should have no special privilege whatsoever in the “rules of conversation.” We should question everything and not allow for one point of view to predominate others and be counted as “fact;” this is not how any other area of life works. Again, this is not an attack on religious individuals or Christmas, but rather a constitutional matter. I don’t intend to be offensive or mean, but this often occurs in the process because people are shaken when their core beliefs are challenged. There is no doubt in my mind that many people will be upset by this, but if my actions of wanting to remove religious displays from government “offends” you, you should think carefully about what it means to be an American citizen. Our constitution ensures that we ought to have a separation of church and state. What, exactly, are you siding with: the United States Constitution or an unwarranted and unconstitutional demand to have religious symbols on government property?